It was a good turnout from locals and CAMRA members alike to celebrate Old Ebor’s success as our Town Summer Pub of the Season on Friday 19th July. During a rare appearance of real summer (hot and sunny for more than 2 hours), it was a perfect night to sink some of Paul Matson’s well-chosen ales at an event that also marked the start of his first beer festival. His son Kieran and business partner Sarah Hill, still recuperating from her recent illness, joined him to receive the award from yours truly, the nominator at the Branch meeting. In what had been a challenging first year in the pub business, the winning team has established a growing reputation among real ale and cider enthusiasts, a welcome addition to the other good real ale pubs in that part of the city centre. 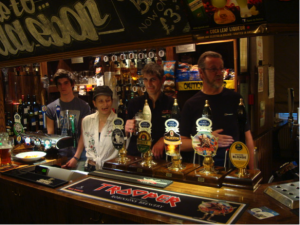 But the regular local customers, even if they preferred alternative drinks, are the lifeblood of pubs like Old Ebor and were thanked for their continuing support. Receiving the framed certificate, Paul remarked that he was honoured to have been nominated and amazed to have won the award and thanked CAMRA members for their support. An interesting choice of ten ales (including four from the Isle of Man) across diverse styles and three real ciders, selected by Sarah, were well sampled. Beers on offer were: Bushy’s Oyster Stout, Ruby Mild and Castletown Bitter; Doghouse Citra Pale Ale (the Manx ones); Big River Ropewalk; Saltaire Blonde; Great Newsome Jem’s Stout; Robinsons Trooper; Theakstons Rivers Answer; John Smith’s Cask. Ciders on offer throughout the festival were: were Sandford Orchards Shaky Bridge; Manx Cider Co, Johnny Jump; Orchards of Husthwaite, Galtres Blush; Mr. Whitehead’s, Novo Pyrus (perry) Rough Old Wife, Blushing Old Wife. This entry was posted in OB117, POTS, Presentations, Pub News and tagged Old Ebor on 28th August 2013 by York CAMRA. 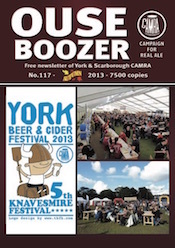 This entry was posted in OB117, Ouse Boozer, Ouse Boozer Magazine on 27th August 2013 by York CAMRA. The sun was shining and the temperature was heading into the high 20s, so it was time for the Country Summer Pub of the Season award to the Wombwell Arms. Fourteen of us travelled by minibus from York through the glorious North Yorkshire countryside to Wass on the 6th July. Passing the impressive ruins of Byland Abbey our anticipation of a good thirst quenching pint was increasing. We were not to be disappointed as Ian Walker, the landlord, was waiting to greet us with a choice of real ales. Other CAMRA members who had made their own way to Wass also joined us. Ian had reduced his beer prices for the event and advertised it within the local community. There were two guest ales, Rudgate Yorvik Blonde and Wensleydale Poacher together with the regular Black Sheep Best Bitter. We sat outside and enjoyed the beer and sunshine before going inside to the Poachers bar where Ian and his staff had laid on an array of tasty canapés for us to sample. 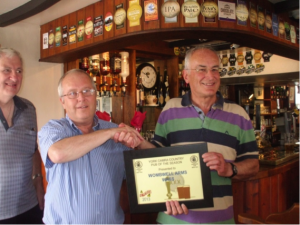 After our lunch, Ian Alford, the sponsor, made the presentation to Ian, the landlord and congratulated him on the continuing success of the Wombell Arms and in particular his commitment to offering real ales from local breweries at the pub. Ian thanked CAMRA for the award and then entertained us with an account of how CAMRA had influenced his life, career in the brewing industry and finally his choice of beers in his own establishment. It was also a tale of the many changes in the British brewery industry over the last few decades. His first involvement with the brewing industry was at the age of three when his father took him to the Scarsdale Brewery in Chesterfield where he worked. That brewery was taken over in 1959 by Whitbread and immediately closed. Latter, while at university Ian worked during the summers with Whitbread in Sheffield stacking crates, working in the office and cleaning cellar tanks. Some of the pub cellars had over 20 tanks and sold more Whitbread Trophy in a week than the Wombwell Arms’ beer sales in a year! In 1976, fed up with the fizzy beer at university he joined CAMRA and along with some friends got elected to the student bar committee, ended the Scottish and Newcastle arrangement and installed hand pumps. His copy of the 1976 Good Beer Guide (much thinner than the latest edition) was passed around as today’s CAMRA members searched for their favourite pubs. After graduating Ian got a job in product development with Watney Mann and Trueman at the Brick Lane London Brewery and in the post Red Barrel era was involved with new brands such as Watney’s Stag Bitter and Trumann’s Tap Bitter. In 1981 with the inducement of a company Ford Cortina he moved to sales eventually becoming General Sales Manager for new business and key accounts. Following takeovers and mergers he moved to the Courage Bristol Brewery which produced Directors, Courage Best and Courage Bitter Ale (3.2% for the local market). Thanks to the Bristol Brewery being a devolved business unit Ian was able to rename this latter beer as George’s Bitter, a traditional name. Along with an advertising campaign he increased sales fourfold and a long term decline in bitter sales was reversed. Following this success a 4.4% George’s Premium was launched for Christmas selling 987 out of the 1000 casks produced. Subsequently the brewery was closed and eventually Courage was taken over by Scottish and Newcastle and Ian became the West Country Regional Sales Director. Following a period of illness and a reorganisation where his job disappeared and Scottish and Newcastle itself were being acquired by Heineken, Ian decided to take early retirement and redundancy to fulfil his dream of running his own business. Ian and his South African wife, Eunice, purchased the Wombwell Arms five years ago. Eunice is the head chef and brings a South African twist to their menu. Originally a micro brewery was planned. However, the need to refurbish the pub and in particular the kitchen, letting rooms and toilets has put the micro brewery on hold for the foreseeable future. A recession and poor weather has also not helped. Recently the Wombwell Arms has introduced a second guest beer alongside Black Sheep Best Bitter. The guest ales are always from local micro breweries and mostly in pins to maintain quality. Business now seems to be improving with last year’s turnover up by 7.5%. Perhaps the micro brewery may become a reality. This entry was posted in OB117, POTS, Presentations, Pub News and tagged Wombwell Arms Wass on 27th August 2013 by York CAMRA. In June, it was time to present our prestigious Pub of the Year award to this year’s worthy winner, the Ferry Boat Inn at Thorganby. The pub won this award for the first time three years ago when it also went on to win the CAMRA Yorkshire Pub of the Year title, which was the first time our branch had produced a regional winner for some years. The Ferry Boat Inn is a genuine family-run free house, which has been run in the same vein, by the same family, for many years. The licensee, Olive Rogers, has had her name over the door since she was 21 and she is now in her eighties. Her daughter, Jackie, and son-in-law, Phil, run the pub nowadays and all three were over the moon to win the title for a second time. Over the last dozen years or so, Phil’s interest in beer has seen the pub gradually increase its cask ale range from one to five, whilst never compromising on quality. By the time our bus arrived mid-afternoon, the pub and large garden were bustling with visitors to the beer festival that Phil and Jackie had organised, with help from Keith Simpson of Brown Cow Brewery, to mark the occasion. As well as the usual six hand pumps in the pub, the outbuildings just outside hosted a temporary bar with another fine selection of beers sourced by Keith from around the country, several of which were from Cumbria, and many of which I had never tasted before. Fantastic! There was even a marquee in the garden for the guest bands to perform in. The weather was very kind, which meant that the presentation could take place outside where everyone was able to see and hear. It was the duty and pleasure of our Chairman, Matt Grant, to make the presentation. He began his speech by apologising to those present who had heard his speech on the same occasion three years ago because it was going to be very similar, as little, if anything, had changed at the pub, which in the case of the Ferry Boat Inn, is a very good thing! He then explained a bit about how the Pub of the Year is chosen by the membership from the 460 plus pubs in the York branch area. Quality of beer/cider/perry is the most important criteria and this is weighted accordingly in the survey process. No one in the audience reported ever having a bad pint at the pub, so it seemed most people agreed with the membership on that point. It was also noted how Phil always tries to have a varied range of beer styles on the bar at any time, including a dark beer such as a dark mild, stout or porter, which has helped these once endangered beer styles begin to regain popularity. The atmosphere/style/decor of the pub was described as being homely and cosy, especially with the roaring fire in winter, and in summer the pub has its amazing, large beer garden leading down to the River Derwent. Matt went on to describe how the pub is one of the most friendly and welcoming he has ever visited, which meant it did well in the service/welcome category too. As regards sympathy with CAMRA aims, Matt noted that Phil and Jackie were both members, they always display CAMRA publicity materials and copies of this magazine, always serve full pints (a key CAMRA campaign) and have been members of our LocAle scheme since its launch. The penultimate category is community focus and when Matt suggested that this pub appeared to be a hub of the community, a local user of pub shouted out that it was the hub of the community. The pub has a quiz night, dominoes team, music nights and several local clubs meet at the pub. The final category is good value and whilst the pub has very reasonably priced products, this category means more than just cost. It refers to the overall value for money and experience that you feel you get from investing time and money to visit the pub. This entry was posted in OB117, POTY, Presentations and tagged Ferryboat Thorganby on 27th August 2013 by York CAMRA.